The flood resilient firehouse will be built with its utilities above the flood level, officials said. 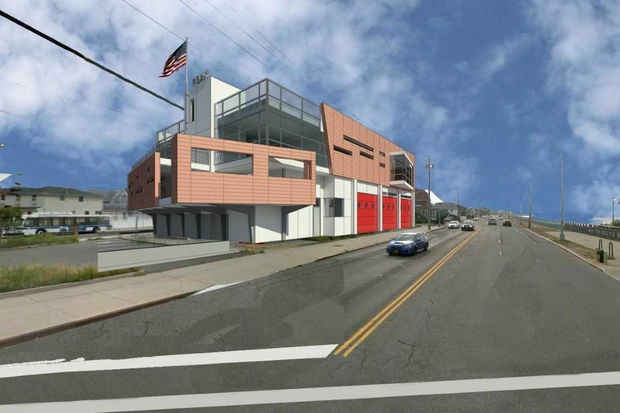 ROCKAWAY PARK — The FDNY is eyeing the site of a bank abandoned since Hurricane Sandy to build a flood-proof "drive through" firehouse with mechanical systems and utilities placed above the flood zone, officals said. The state-of-the-art facility would replace the century-old firehouse on Beach 116th Street, which is cracking and crumbling on the inside and out, officials said. The FDNY is unsure of the full extent of the damage to that location — home to Engine 268/Ladder 137 — because they can't do target demolition because it's a historic structure, an official said. They're now seeking the city's approval to buy a lot 200 yards from the current firehouse, at 116-11 Beach Channel Drive, that's been home to a bank abandoned since Hurricane Sandy. The new 10,000-square-foot firehouse will be more resilient, according to David Harney, the chief of staff to the Deputy Fire Commissioner for Support Services, who presented the plans to Borough President Melinda Katz's land use meeting last week. The apparatus floor will be designed with flood resistant materials in case of another major storm. It'll also be the department's first "drive-thru" facility that will allow fire trucks and other official vehicles to enter the house from more than one side — which will hopefully reduce traffic on bustling Beach Channel Drive, Harney said. The location, though, is opposed by Community Board 14, which fears even more traffic at the busy corner, according to District Manager Jonathan Gaska. They instead proposed an empty lot along the Rockaway Freeway for the new firehouse, although it would require environmental remediation, an FDNY official said. The city still needs to approve the purchase of the lot before any plans move forward. It's not clear when construction would begin.